Designs by Lisa Somerville: Need it? Want it? Gotta have it ALL? Need it? Want it? Gotta have it ALL? If you've seen the new Fall/Winter 2008 Idea Book and Catalog and you've GOT TO HAVE IT ALL, why not join one of my clubs! As a member of my Stamp Club - you agree to purchase a minimum of $25 (before shipping & tax) per month in SU merchandise for six months. The Club will run from August 2008 - January 2009. Orders are due on the 15th of each month, your credit card will be billed each month for your order, unless you have made other arrangements for payment. This is a great way to build up your supplies gradually. Soon you will have a great collection of stamping product! Everyone gets their turn to be the “hostess.” This means you collect HOSTESS BENEFITS! You’ll receive a Level 1 Hostess Set plus $15 in FREE product during your hostess month. Just call in or email me your order by the 15th of each month. If it's your month to hostess, you can schedule an in home workshop (if your local)/a virtual workshop/or collect outside orders to boost your FREE merchandise. Email me today to join my Stampers Club! At Convention it was announced that Stampin' Up! 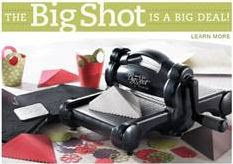 has partnered with Sizzix to offer you you a multipurpose, manual die-cut system! With the Sizzix Big Shot™ and dies from Stampin’ Up!, you can create multiple die-cut shapes, envelopes, and tags quickly and easily—a significant timesaver for workshop preparation and holiday projects! Use the Bigz™, Originals™, Sizzlits®, and Decorative Strip–sized dies to make personalized cards, scrapbook pages, home décor, and more. The Big Shot machine works with more than 50 materials, including card stock, Designer Series paper, fabric, chipboard, plastic, and more. The Big Shot uses our exclusive Stampin’ Up! dies or Sizzix dies—plus it’s compatible with other dies on the market. Beginning in September, each member of the Big Shot Club agrees to purchase their own Big Shot Limited Edition Starter Kit in 4 monthly installments of $59.66 (note this is based on 8.5% sales tax – amount may be adjusted for your tax rate). When it is your month as hostess you will receive all the items in the Big Shot Special Edition Starter Kit, and a FREE Sizzlits Die ($4.95 Value) of your choice. You will also receive the hostess benefits of a FREE Level 1 Hostess Set and $15 in FREE SU Product (note shipping and tax may apply to your free product depending on your state). You can collect outside orders during your month as hostess to increase your Hostess Benefits! The first 2 people to join my Big Shot Club will also receive the die cut pieces from Stampin' Up! 's exclusive die - Baskets & Blooms Bigz XL Die! Email me today for more information on my Big Shot Club!